The travel tag inspired invitation is definitely one of the most popular styles that I do- it's different and unique to Retro Press; it was the very first invitation that I ever designed in fact! There are so many designs that I can apply to this style of invite; you can make them rustic/ vintage using kraft paper and twine or you can make them quite classical on white beautiful paper, finished off with ribbon... Like the pocketfold invitation, the travel tag is more of a format- the overall look and feel of them depends upon what tone you want to set for your big day. 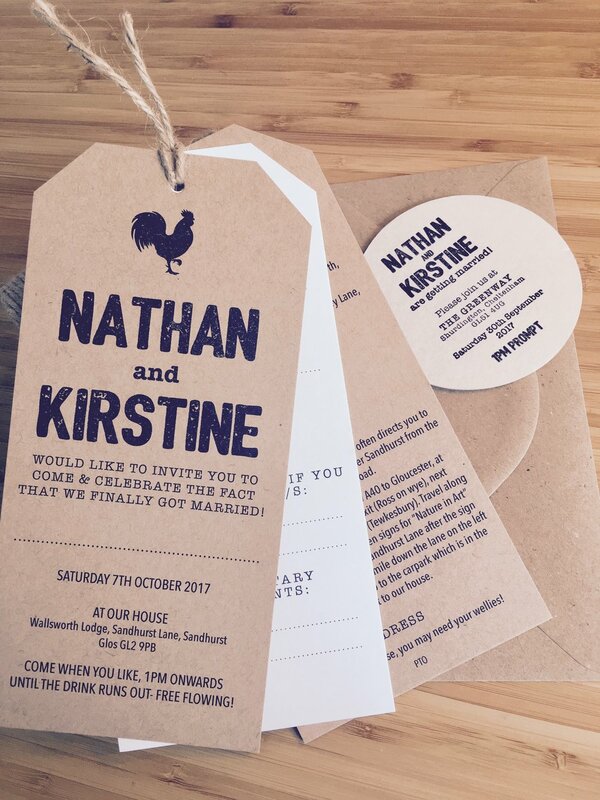 The wedding invites in this post definitely have a rustic feel, with the addition of the cockerel at the top only enhancing this- which was a specific request from the bride & groom to be. It's so important to set the right tone from your invitations- these are just perfect for this particular couple as they are having their marriage celebration on their farm. The hand printed letterpress coasters went with the invitations also.